Hiking, biking or just ambling. If you're an active person that gets thirsty, you'll appreciate Stansport's daypack with an included hydration system. We started with a tricked-out 20 liter day pack, powered by double diamond ripstop polyester construction, and added cool features like a zippered stash pocket. Hiking, biking or just ambling. 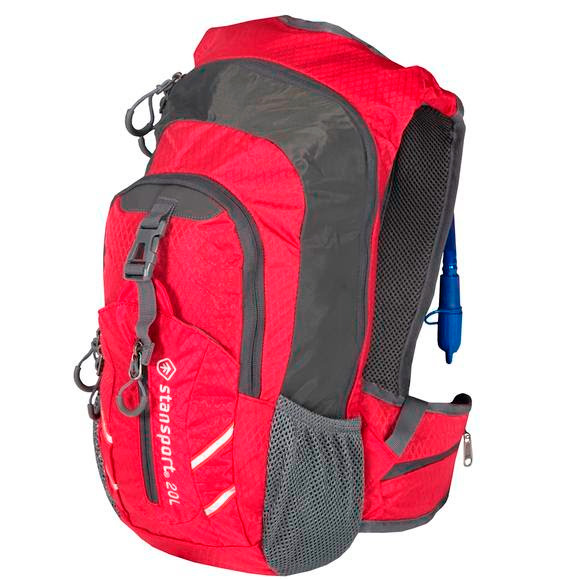 If you&apos;re an active person that gets thirsty, you&apos;ll appreciate Stansport &apos;s daypack with an included hydration system. We started with a tricked-out 20 liter day pack, powered by double diamond ripstop polyester construction, and added cool features like a zippered stash pocket. Then, they&apos;ve included a 2 liter hydration reservoir, complete hose, and covered drinking port. The entire package is anchored by secure, comfortable waist belt and sternum strap, for sturdy reliable hydration wherever you go!